NORFOLK, Va. (WAVY) -- A local sorority chapter is facing allegations of racism. The behavior was called out in a series of tweets, with the posts showing racist behavior during events and on social media. 10 On Your Side has been looking into these accusations and learned the sorority chapter has been temporarily shut down. The sorority in question is the local Alpha Phi chapter at Old Dominion University. School officials said they are investigating and the group cannot hold any official events until further notice. The allegations came to light Wednesday morning when a Twitter user posted several tweets claiming to expose racist behavior within the sorority. 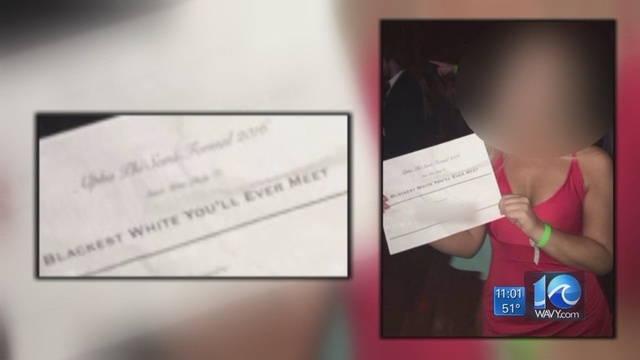 In one tweet, a young woman is seen holding a certificate that says "blackest white you'll ever meet." If you look closely, the words Alpha Phi Semi Formal are printed on the top of the paper. The Twitter user also posted other screenshots of a tweets containing racial slurs shared by someone they claim to be a sorority member. The person behind the Twitter account claims to know minorities who were targeted and says they decided to post to social media because "no one wants to do anything about it." "It doesn't shock me at all,” said a former Alpha Phi member who wanted to remain anonymous. "I didn't feel like I had the sisterhood that I thought I was going into. I felt ostracized kind of. I had heard these things that were going on after I left, like I wasn’t surprised. I was glad that I left." ODU encourages any student who has concerns about racial discrimination to contact its Office of Institutional Equity and Diversity at 757-683-3141.